What comes to mind when I say “tanks that can jump”? The Blaster Master series perhaps? Well, Topstitch Games took that idea and expanded upon it to create Treadnauts, a physics-based fighter in which two to four tanks drop into an arena and blast each other to bits. It’s a simple concept with several bizarre twists, thanks to the liberal use (or misuse) of the laws of physics and a lengthy list of in-game modifications. Above: the face of every player that didn’t survive this round. 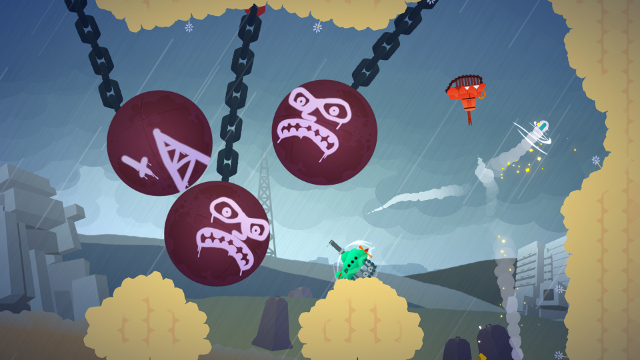 At first glance, Treadnauts bears a slight resemblance to another game: Towerfall Ascension. Similarities do exist from a structural standpoint—enclosed arenas, being able to score kills with shots or stomps, a variety of modifiers for multiplayer matches—but where it differs the most is with movement. Each tank can drive up walls and along ceilings. They can double jump and, thanks to the recoil of every shot, launch into the sky or across the arena by aiming at the ground in mid-air and firing. 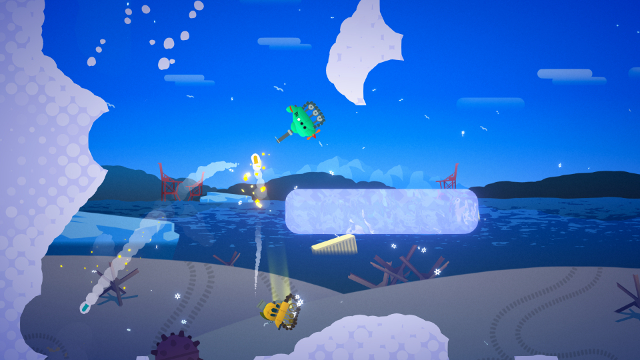 A tank hovering across the map by firing at the ground repeatedly is not unusual for Treadnauts. The only thing the tank treads don’t stick to is ice, and there’s a button to disengage them and slide down inclines and across surfaces. Ramming a tank hard enough will stun them, making them easy pickings for other players. Landing treads-first on a tank will squash it, and shooting a tank will… well, you know. The controls for everything, namely movement, are quite responsive. Shooting, however, is a different beast altogether. 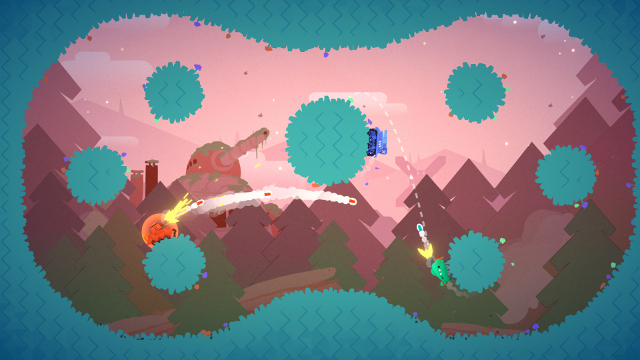 To shoot in this game, you hold the fire button, a line extends from the turret showing the path of the shot, then release at the trajectory you want. This line, and the turret, move up as the button is held until it’s completely vertical, at which point your shot is going straight up no matter what. The bigger issue here isn’t aiming, though; it’s reload time. Tanks can fire three shots before needing time to reload, but the visual cue for how much ammo a tank has is a tiny set of lights on the tank itself. When tanks were bouncing around the stage I could never tell how many shots I, or anyone else, had available. Sure, shoot the middle sections. What’s the worst that could happen? That was also the case in the game’s single player mode, Target Test. Here you enter each multiplayer map and break a set of targets as quickly as possible. Doing so fast enough will garner a bronze, silver or gold medal. Considering there are four worlds with ten maps each for this mode (though you have to unlock the later ones), full completion takes quite a while. The strict completion times also play a role, with some maps and target placements being far more difficult than others. Sometimes I would get a silver medal on the second try, and sometimes I’d struggle for ten to fifteen minutes just to get bronze. For reference, bronze completion times range from about 13 to 23 seconds while gold times are typically anywhere from 6 to 12 seconds. I can count on one hand the number of gold medals I earned. The music and sound follows suit, with the frantic combat in some matches sounding like a modern Hanna-Barbera sound library. The music in various menus comes off like a low key 70s gameshow, while each world gets a song which somehow manages to sound both dreary and upbeat while fitting the environment on screen. It’s easy to overlook, but the sound design compliments the visuals nicely. Forget flying cars. How far in the future do we get flying buildings? The maps themselves also vary a fair bit within each world. Each has hazards to contend with like ice, wrecking balls which can break loose from the ceiling, floating balls of electricity, levitating platforms affected by the weight of tanks on them, or snowy ground which dissipates as tanks drive over it, just to name a few. While load times were never an issue going into or out of matches, one of Treadnauts’ bigger flaws, aside from only having local multiplayer, is performance. 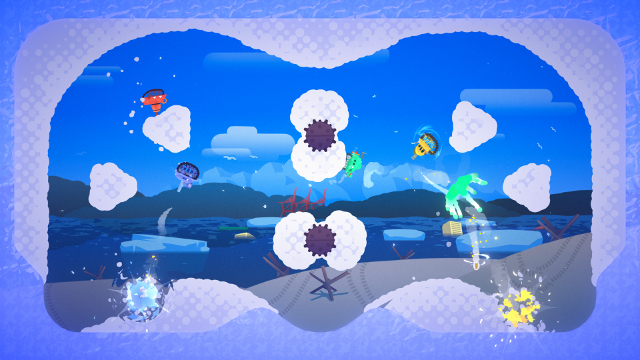 When the screen fills with too many visual effects, or too many things move too fast, the game has a tendency to either slow down, drop frames, or both. The framerate easily drops into the mid-to-low-teens on certain maps when using speed boosts or smoke clouds, sometimes approaching single digits. A patch to address this should definitely be on the agenda for Topstitch Games. That’s less likely to happen if fewer modifiers for matches are turned on. Treadnauts includes an absurd amount of modifiers that allow virtually everything in a match to be altered. Aside from the ability to add AI tanks and adjust their difficulty, you can change the size and speed of the tanks, what they fire (shells, lasers, bounce shots, sticky bombs, nothing, etc. ), reload speed, gravity or lack thereof, shields, item crates, and a laundry list of other options. It’s equal parts hilarious and frustrating to, say, have invisible tanks which can’t shoot stuck moving at full speed on a map of nothing but floating platforms. If you enjoy this madness though, there are 11 save slots for custom modifier settings, in addition to six presets and a random button. The catch is that these modifiers, in addition to things like extra maps and an unlockable fifth tank, have to be earned by collecting experience. Every multiplayer match and every Target Practice medal earns experience and, after reaching a new level, something gets unlocked. Not only does Target Practice not give experience unless earning a new medal, but gains slow down as your level approaches the cap of 30. It took me three hours to reach level 12, but three hours later I was at level 18. By the 8-hour mark I was so tired of grinding for levels that I tried making all-CPU matches to play in the background. These don’t earn any experience. My money’s on the orange tank. It’s unfortunate I got worn down by the grind, because the multiplayer combat is quite fun. Arenas are never so big that players can easily hide, unless cloaking tanks are turned on. The dozens of modifications allow for virtually any type of match to be played on the spectrum of seriousness, from ‘Final Destination No Items’ to ‘Barely Playable Gigglefest.’ My only gripe is that multiplayer for the version I played (the Switch version) isn’t online, only local. The Steam version can do both. 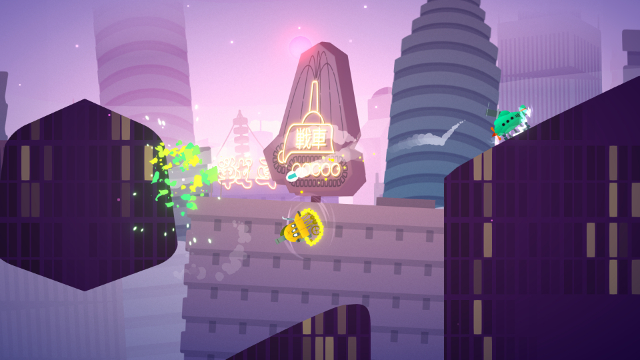 Your mileage with Treadnauts will vary wildly, depending on how much you make use of multiplayer and how determined you are to unlock everything. From my experience, maxing out at level 30 took a little over 11 hours. While it requires a fair amount of time to complete, the single player Target Test mode loses its luster after the first couple dozen stages and devolves into a chore. If this is the kind of game you plan to regularly spring on unsuspecting friends or break out at get-togethers, the $10 price tag might just be worth it. Otherwise, waiting for a price drop, or a patch for some of the performance issues, is likely the way to go.